Not long ago, a company called Fanatics contacted me to ask me to put together a look with one of their jerseys. Their instructions were simple, pick a jersey out of the huge selection that they offer, and put together an outfit that I'd wear to cheer on my team! Now, I won't lie and say that I'm a big football fan, but I do love getting together with all of my family on Sundays and eating good food, and I can always get behind a cute outfit, so here goes! I tried to pick a more put together version with jeans and booties, but then also a more relaxed but still cute version…with leggings (of course). I'm really obsessed with both booties and leopard flats at the moment, so I wanted to include those, and my obsession with Tory Burch is nothing new. I really like that Fanatics has the classic fitting jerseys, but also a slim fit version, because when I'm relaxing at home I like to have a loose fit over leggings, but when I want to wear it out of the house with jeans, I want a more defined fit, know what I mean? I picked the Saints and Drew Brees because I really had no other choice (unless I wanted to be shunned by everyone I know). Being from Louisiana, it was quite obvious that the Saints were my only option, and when it comes to the Saints, there's no one better than Drew Brees. I especially like that while he's a great quarterback, he also seems like a great person and father. I actually had the chance to meet him when I worked at the State Capitol this year and he was absolutely lovely, very kind and nice, even under pressure and in the middle of a huge commotion, which I happen to think is much more important than his football skills. 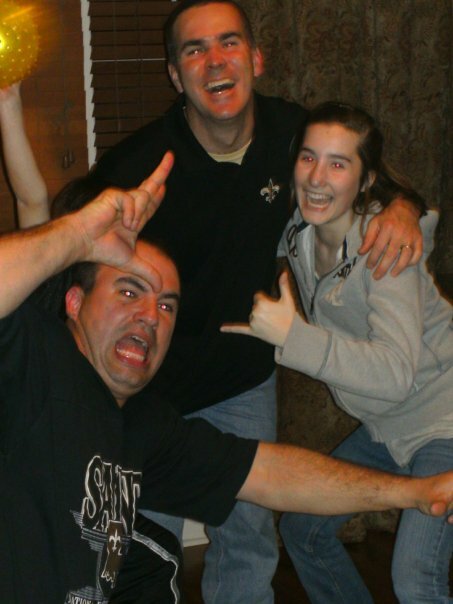 Just for laughs, this is a picture from literally the second after the Saints won the Superbowl in 2009. It was such a good day filled with family and fun and I remember feeling so proud of "our team." Who do you root for on Sundays? P.S. - Please please please don't forget to vote for me in Stylefruits' Hit the Books Competition! I need y'alls help and every vote counts!